A collection of Bengali literary works and occasional translations, with a random punctuation or two. On this Februrary day, a post in remembrance of our language movement. When Atul Prasad Sen write Moder Garob Moder Asha about a century ago, Greater Bangla was going through a renaissance, and this song, lovingly written about Bangla, describes how the language holds the emotions of a Bangalee, and the essence of his/her nationality. During Bangladesh’s Liberation War, the song inspired freedom fighters. Five decades later, I hope it inspires us to hold on to and nurture our roots. This post is written with somewhat mixed emotions: to a Bangalee, the words ‘Ekushey February (21st February)’ should be so close to the heart that one would not have to explain its significance to him/her at all. But in a time when a dumb acceptance of everything that is Western is the norm, how I wish that was true! There are people, however, who continue to work to uphold and promote Bangla against all odds, and in defiance of the ‘globalization’ to which the rest of us have surrendered. 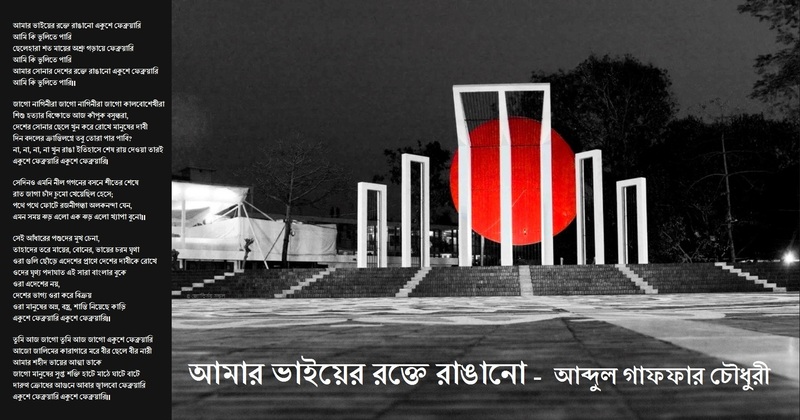 For them, as an inspiration, a song that reminds of a greater sacrifice that we Bangalees once made for our mother-tongue – Amar Bhaiyer Rakte Rangano (My Brothers’ Blood Spattered). দিন বদলের ক্রান্তিলগ্নে তবু তোরা পার পাবি? incarnadined by the love of my brother? Can I ever forget it? in anger and protest against the massacre of innocent children. by murdering the golden sons of the land. by the twenty-first of February. fierce like a wild horde of savage beasts. Even in the darkness we know who those beasts were. of all mothers brothers and sisters. They kicked at the bosom of Bengal. They did not belong to this country. They wanted to sell away her good fortune. They robbed the people of food, clothing and peace. On them we shower our bitterest hatred. Wake up today, the twenty-first of February. Our heroic boys and girls still languish in the prisons of the tyrant. The souls of my martyred brothers still cry. by the flame of our fierce anger. How can I ever forget the twenty-first of February? This time, a musical post. The lyrics of Ektara Bajaiyo Na (Don’t Play the Ektara) do not belong to high literature, and neither does the music rank high among compositions, yet the song remains one that many a Bangalee has heard, thanks to its catchy tune and friendly tone. Listeners of the song ascribe various meanings to it, but to me, it is a masked criticism of Bangalees who, in their eagerness to adopt the dumbed-down aspects of Western culture, have lost much of what is indigenous to them. The song, and the accompanying video, is in acknowledgment of that perceived undertone.